UPDATED: Tue., Jan. 30, 2018, 6:42 p.m.
Getting there is an enormous accomplishment. Getting back the following year isn’t easy, but it happens fairly often. We’re talking about reaching the Final Four and the Final Four encore. Three of the 2017 Final Four teams fully comprehend how hard it is to reach college basketball’s holy grail. Gonzaga and South Carolina were first-timers. Oregon won the inaugural NCAA title in 1939 – an eight-team affair – and 78 years later made its second Final Four. It’s seemingly old hat for North Carolina, which has been to an NCAA-record 20 Final Fours. None of the four is a lock for the NCAA Tournament, but No. 19 North Carolina, projected as a four seed by ESPN.com, and No. 14 Gonzaga, a 5-7 seed on most brackets, are in good position. Oregon (14-7), which sits seventh in the Pac-12, and the South Carolina Gamecocks (13-8), tied for sixth in the SEC, probably need big finishes or a conference tournament title to dance again. The Gamecocks, who made it last year with a 22-10 record, are listed third on ESPN.com’s next four out, which comes after the first four out. Gonzaga knocked on the Final Four door several times during its streak of 19 consecutive NCAA Tournament appearances, beginning with the 1999 team’s magical run to the Elite Eight. The 2015 squad bowed out in the Elite Eight after losing to Duke. In the 19 Final Fours since 1999, 11 programs went back-to-back years. That doesn’t include three-year runs by Michigan State (1999-2001) and UCLA (2006-08). Kentucky and Wisconsin both made the 2014 and 2015 Final Fours. Programs that beat the odds and return to the Final Four have a good shot at winning it all. It’s happened three of the last five seasons and seven times in 19 years, beginning with Michigan State’s 2000 championship. Florida claimed consecutive titles in 2006 and 2007. Three teams, Wisconsin in 2015, Butler in 2011 and Kansas in 2003, lost in the championship game. If the Zags are looking for a role model for following up a Final Four season, North Carolina is a good place to start. The Tar Heels lost a heartbreaker to Villanova in the 2016 title game before edging Gonzaga in last year’s final. North Carolina lost in the 2008 national semifinal but came back to win the 2009 championship, handling Gonzaga 98-77 in the Sweet 16. The 2017 Final Four squads have undergone major roster revisions this season. Gonzaga had two players drafted and lost four of its top five scorers. North Carolina’s Justin Jackson and Tony Bradley are in the NBA, and forwards Kennedy Meeks and Isaiah Hicks are in the G-League. Oregon sent three players into the NBA. Sindarius Thornwell, who was South Carolina’s best player, is with the L.A. Clippers. Gonzaga and North Carolina have the best chances of the 2017 quartet to reach the Final Four in San Antonio, but neither team is as strong on paper. The Zags don’t have as much size, depth or experience as last year’s squad, but they have a strong core of seven. Gonzaga remains high-powered on offense but is susceptible to more dry spells. Last year’s Zags were outstanding on defense. The current squad yields eight points more per game. The Zags (19-4) receive mixed grades from some of analytics that will be used by the selection committee. As of Tuesday, GU is 56 in RPI, 53 in KPI, 8 in Sagarin and 7 in KenPom. 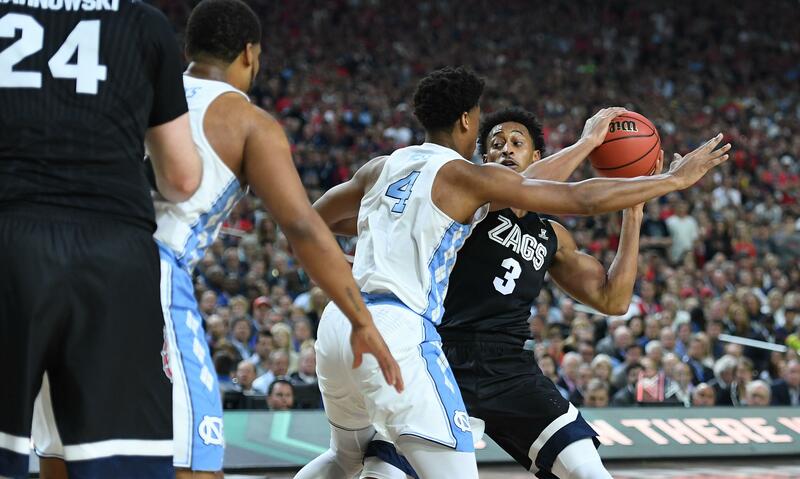 North Carolina, like the Zags, lost four of its top five scorers from last season but returns 2017 Final Four most outstanding player Joel Berry II. Forward Luke Maye has emerged as a top scorer. The Tar Heels are averaging two fewer points and yielding two more points per game than the national championship team. UNC (16-7) still boasts strong metrics, between 9-13 in RPI, KPI, Sagarin and KenPom. Published: Jan. 30, 2018, 5:42 p.m. Updated: Jan. 30, 2018, 6:42 p.m.